Judge Robert J. Elgee has put the final stamp of approval on dismissal of a court action filed by convicted murderer Freddy Tellez, ruling in 5th District Court on Monday that Tellez's claims about lack of proficiency in English are without merit. "I'm not willing to accept his bare-naked assertion that he has difficulties with the language," Elgee said in quashing Tellez's petition for post-conviction relief from his 24-years-to-life prison sentence for killing a 16-year-old Wood River High School student in Hailey in 2007. Elgee already issued an order of dismissal in October 2011, ruling then that Tellez, who filed his petition in September that year, had missed the filing deadline by almost five months. However, under Idaho law, Tellez had 20 days to request reconsideration of the ruling and such a request was made by his court-appointed attorney Cheri Hicks. Elgee listened to oral arguments from Hicks and Blaine County Prosecuting Attorney Jim Thomas on Monday. Hicks told the judge that her client claimed he missed the deadline because he is not proficient in English and was unable to understand court documents in his case, that he did not have access as a prison inmate to a law library and that he was only 17 when he was charged with the murder, and as a teenager did not have an adequate understanding of the law. Thomas argued that he's not aware of a prison facility in Idaho that doesn't have law books available to inmates and that regardless of Tellez's age that he had "capable legal counsel" during court proceedings against him and was fully advised of and agreed to decisions affecting his case. Thomas also noted that Tellez, a U.S. citizen of Hispanic ancestry, never in all the court proceedings in the murder case requested to be provided with a Spanish-speaking interpreter. Elgee made it clear at the hearing that he was not going to consider the claims of Tellez in the post-conviction-relief petition, but was only going to consider the filing deadline. The judge noted that lack of proficiency in English could be a determining factor in overturning the dismissal, but ruled that Tellez had not demonstrated such was the case. "I recall that he did not have an interpreter," Elgee said. "I'm not accepting his assertion that he has language difficulties. I'm not going to overturn the dismissal." Hicks said after the hearing that her client's next recourse would be to appeal Elgee's decision to the Idaho Supreme Court. Tellez claims in his post-conviction-relief petition that he should not have been tried as an adult, that he was coerced into pleading guilty and that he had ineffective legal counsel during the murder case proceedings. He was seeking a new trial or withdrawal of his plea. 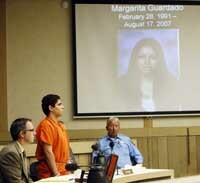 Now 21, Tellez pleaded guilty to killing his former girlfriend, Margarita Guardado, in the street in front of her home in southeast Hailey on the evening of Aug. 17, 2007. According to police reports, Tellez hit Guardado four times in the head with a hammer, then poured a flammable liquid on her and lit her on fire, making her body unrecognizable the next day, even to her mother. Originally charged with first-degree murder, Tellez pleaded guilty to second-degree murder and was sentenced on Aug. 7, 2008. He is currently listed as an inmate in Cellblock H at the Idaho state penitentiary near Boise. According to prison records, Tellez is not eligible for parole until Aug. 19, 2031.